An early start as the Main Time Control (MTC), to check us out for the day, is not in the hotel but at the N-Ring and people are leaving an hour and a half to get there for the first test of another long day. Our start time on the track is 08:56 so we are on the road by 7:15. 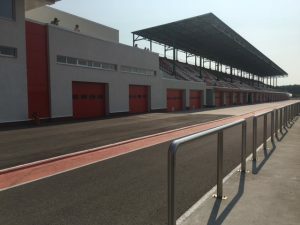 Once we get to N-Ring the car park has the usual spectators but the pit lane is eerily empty. 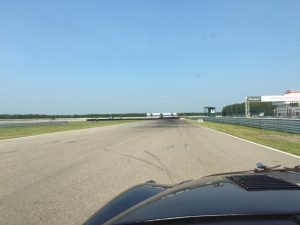 We line up behind a modern 911 which is a bit of a mismatch but we are told by the marshall that he is heading out to a point on the track to set up to take photos – not sure that we are going to be hindered by him however hard we drive. 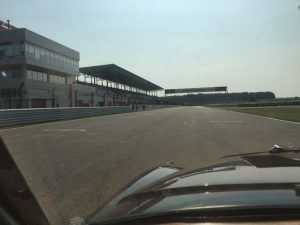 Unlike the circuit in Kazan this one is flat with a mix of tight and sweeping bends that once again the Jag handles with aplomb. 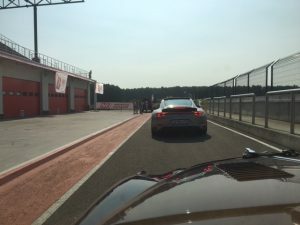 It is a shame that we have to do these tests fully loaded – we are not allowed to unpack luggage, spares etc – so we are driving a pretty heavy car around the track. 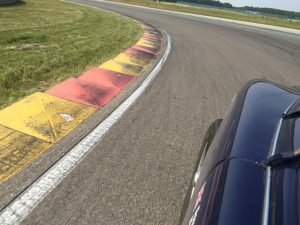 However, as we are still afflicted by one of the rear wheels scraping the arch the fact that we were relatively light on fuel made a big difference. While we were repeatedly told to pack light, a few T-shirts don’t make much difference but 100 litres of petrol do. Given that fuel stops are plentiful now we make the decision to run on one tank rather than two and reduce the pressure on the suspension.